The Thermionics e-beam evaporator deposits thin metal films by thermally evaporating metals using a highly focused electron beam. Crucibles and sources must be provided by the user. The e-beam is produced by a 20 keV power supply. The system is equipped with an Infinicon XTM/2 crystal monitor for accurate deposition thickness. 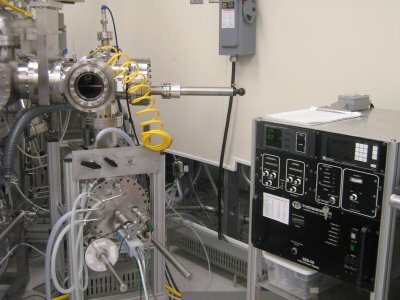 This system is currently attached to the Cluster Tool which allows the users access to metal sputtering, dielectric sputtering and e-beam evaporation without breaking vacuum. The cluster tool is equipped with a loadlock system which reduces system contamination providing for cleaner film deposition.